Playground and outdoor play are crucial for young children’s development. Social, fine motor, gross motor, learning how to live an active lifestyle, and developing skills needed to be successful in many things throughout life are just some of the few things children will gain from playground and outdoor play. Playground equipment, specifically, targets strengthening, balance, motor planning, endurance and vestibular functioning while interacting with peers on the playground. 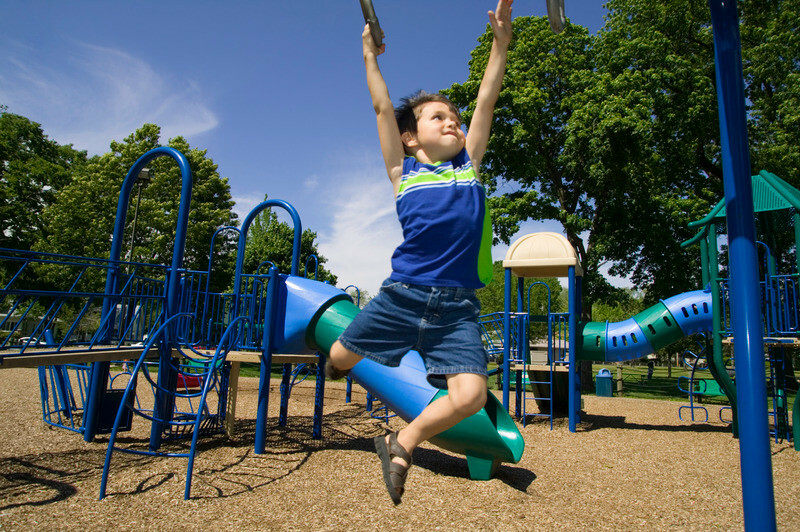 Below describes how the common equipment found at playgrounds can benefit your child. Playgrounds have a variety of surfaces, including gravel, grass, rubberized surfaces or mulch. These different surfaces give children the opportunity to work on balance and transitions. This also helps the child create awareness of where their body is in space (proprioception). Swings work on core strength and postural control. They also work on coordination and vestibular input. When pumping their legs, they need to coordinate bending and straightening their knees as they extend and flex at their trunk and elbows to create the momentum needed to move back and fourth on the swing. Ladders to climb on work on fine motor planning and strength. Children are forced to asses the equipment to figure out how to move their body in order to climb while maintaining balance. This targets vestibular system and proprioceptive skills for balance. The unstable surface makes our muscles react in order to maintain balance. Slides also use trunk and core muscles in order to remain upright while going against the momentum that is pushing us backwards. This works on core, back and upper body strength while also working on coordination. It is not uncommon for children to struggle at the playground. If you see your child needs help in any of the areas listed about please fill out our simple online form here.